So, last time, I introduced you to 7 ways to modify instruction for newcomer ELLs. The first one on the list was Scaffolding and Support, so that's what today's post is going to focus on. You might want to put on a helmet, because I'm about to throw a lot of information your way! 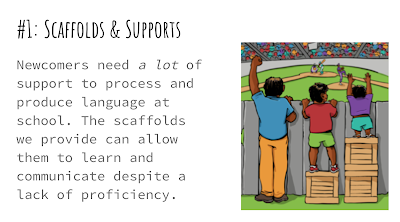 What is scaffolding & support? Scaffolds and supports are strategies used by the teacher or tools that are provided to the learner. These tools and strategies provide students the "boost" they need to be able to access the content, understand input, and communicate knowledge despite a lack of English proficiency. Doesn't scaffolding make it too easy? What if they don't need it? Scaffolds are essential for newcomer ELLs. ABSOLUTELY. ESSENTIAL. As students gain proficiency, you can easily remove scaffolds and supports that you have put in place to allow them to function more independently! Scaffolds can also be switched so that you can use them to support students in reaching beyond their current level of proficiency. What students will need to access the language and content will vary from student to student and based on the student's actual level of proficiency. It's important not just to consider their overall score, but also their scores for each subdomain- students may need more support in one language domain than in another. Scaffolds should be appropriate for proficiency level! If you remember in my last post, we talked about what newcomer ELLs are able to do in terms of processing and producing language. For our newcomer students, we are providing very simple input with simple sentences, common phrases, and basic words and expressions. Our expectations regarding production should be based around learned words and phrases, small chunks of language, and basic vocabulary usage. 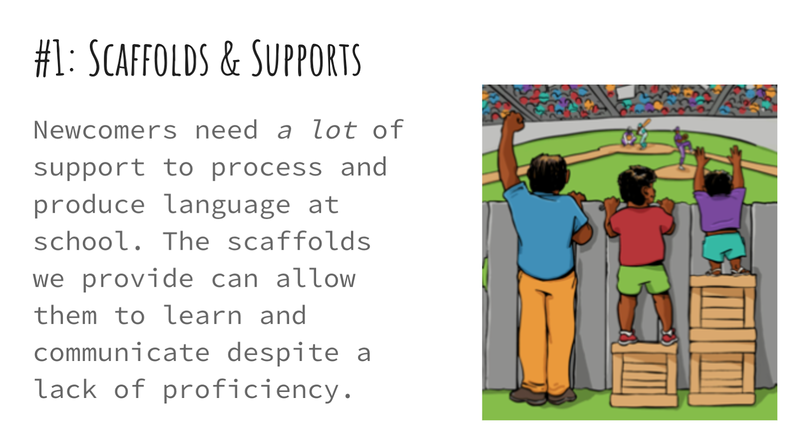 This is what we need to be scaffolding students toward, so the strategies we use and the supports we choose should be geared toward that level of language proficiency. What types of scaffolds and supports can I put in place? As you know, I'm in a WIDA state, so when introducing teachers to scaffolds and supports, I always turn first to those three types identified by WIDA- Graphic, Sensory, and Interactive. The suggestions contained within the chart are really just a jumping-off point- this list is certainly not exhaustive. WIDA also offers a list of possible supports divided by content area. Again, this list is not exhaustive! 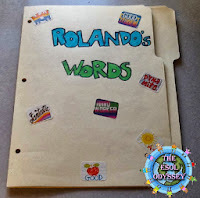 Personal Word Walls: Personal word walls are a great tool to provide your newcomer ELLs! They can fill theirs with words they need to learn and carry it from class to class. With each new word, they can include a drawing or even the word in their native language. You can also use Picto4Me to create personalized, visual word walls! Word banks: Word banks are one of the easiest tools you can include for your ELLs, especially on activities where they're expected to produce language. For newcomers, one of the most difficult things is often remembering the vocabulary they need in order to express an idea or demonstrate knowledge. Word banks for newcomer ELLs should include words that they've already learned and that are relevant to the topic. Classroom Word Walls: You may already have a word wall, but are you using it to full potential? Classroom word walls can be an excellent scaffold for newcomers when used effectively- they should be visible, interactive, and relevant . You can also find some excellent math word walls in my TpT store! Sentence Frames: Sentence frames can really help students at all levels, but they're particularly effective for newcomers who have little to no understanding of the structure of the English language. They may have the mathematical ability or scientific knowledge to answer a question, but they don't have the language to communicate their answer. Sentence frames to the rescue! When using sentence frames, review and model them for students so they know how to use them effectively. After a few days of students using these frames in speaking and writing, you can usually remove them! Visuals: The use of visuals is more to provide support to your newcomer as he or she is processing input. If the student can associate a word or phrase with a visual image, then they are more likely to understand and acquire the word into their own "language bank". You can create class picture cards using images from a Google search, insert images into powerpoint, add images to your word wall. Really, any way you can incorporate visuals is excellent. Another great way to incorporate visuals is to use picture dictionaries- ask your ESL/ESOL specialist if they have any you can borrow. Pictured below are some of my favorites from Oxford, or you can also create your own picture dictionary! Technology: Technology is a great way to help your newcomer ELLs acquire English. As a note though, I recommend no more than 30 minutes of solo computer time a day for newcomers. It is really important that they participate with whole group activities and interact with peers during class time! Learning Chocolate: Great website that helps students practice vocabulary (with visuals) using all four language domains! Quizlet: This is a great choice for helping ELLs learn new vocabulary with pictures and audio. Learn more with this article. Read&Write for Chrome: This great tool is from TextHelp, and it has many great functions to help your ELLs, like text-to-speech for reading documents and webpages, translation and annotation tools, and even speech-to-text! Learn more with this article. Rewordify: This is a great tool for simplifying the language used in a text. It's not perfect, but it's a great starting point. Be sure to proofread, and simplify further if needed. Learn more here. 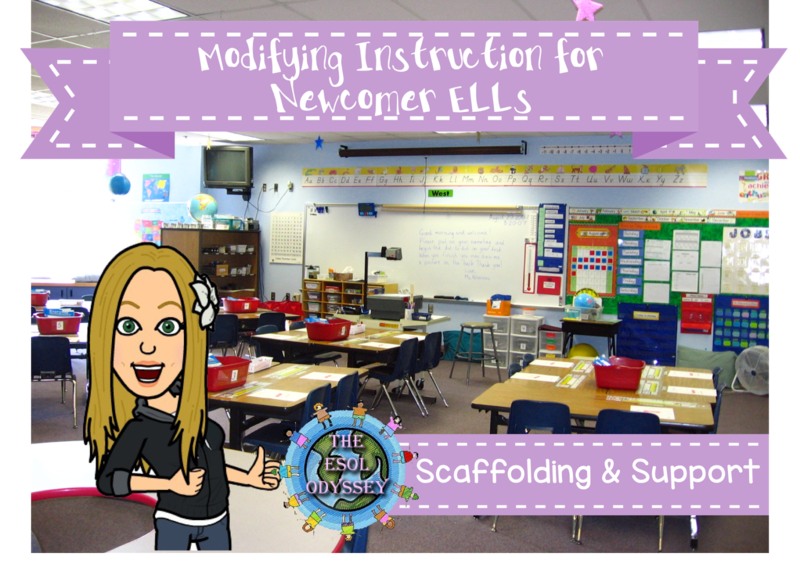 I hope these tips, tools, and strategies for scaffolding and support help you as you modify instruction for your newcomer ELLs! 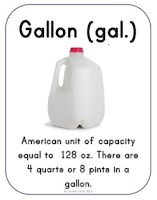 Don't miss the next post in the series- Comprehensible Input. I am a college student in Oregon, I came across your blog and I loved it. It gave me a better understanding of how to scaffold an ELL student and ideas to help support them. With being out of state I do have a question what is WIDA? Hi Mrs. J, thank you so much for posting this! I am new to teaching ELL students and I am thankful for all the suggestions you have provided in this post, as well as other posts. When using a word bank with students, at what point to you begin to move away from that? Do you continue to use a work bank all year? I think that depends entirely on the student! It's important to keep the supports in place as long as the student needs them to communicate effectively. As the student gains proficiency, you might change the number or types of words you provide in the word bank.